Updated Cape Cod, Ready to Move In! You will be absolutely wow'ed by this home in Celebrate! Additional Features and Amenities This 2 bedroom, 2 bathroom Acacia Model home features approximately 2,329 square feet and is to die for! 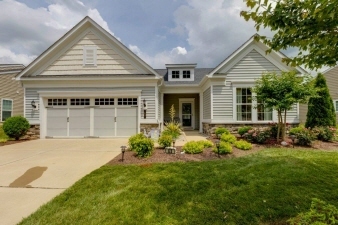 This home shows like a brand-new model and has so many extras. Don't miss the curb appeal and architecturally interesting exterior on your way in to this stunner. The kitchen, dining room, and family room combo is a entertainer's dream. The modern, open floor plan allows you to entertain easily. The gourmet cook's kitchen features an island with seating for quick meals and extra meal prep space. The wooden 42 inch cabinets with soft close drawers, brushed chrome knobs, and quartz countertops are so very chic and the recessed and task lighting brighten up this already light and bright living space. Additional living space in the office and the sun room allow everyone to spread out. The additional three-season room features EZ Breeze Windows and solar shades. Retire at the end of the day to the master suite with custom closet system and dreamy bathroom. Too many extras to list!